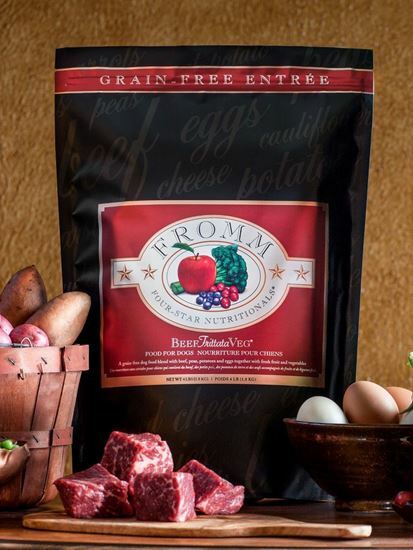 Fromm Four-Star Beef Frittata Veg® Recipe Food for Dogs is a delectable grain-free blend of beef, peas, eggs, and potatoes combined with an assortment of fruits and vegetables. 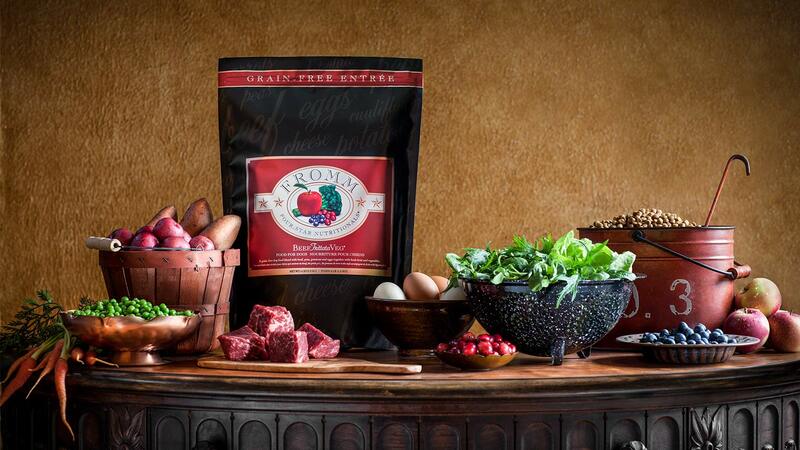 This distinctive blend is specially prepared to ensure consistency, quality, and superior taste in each and every bowl. 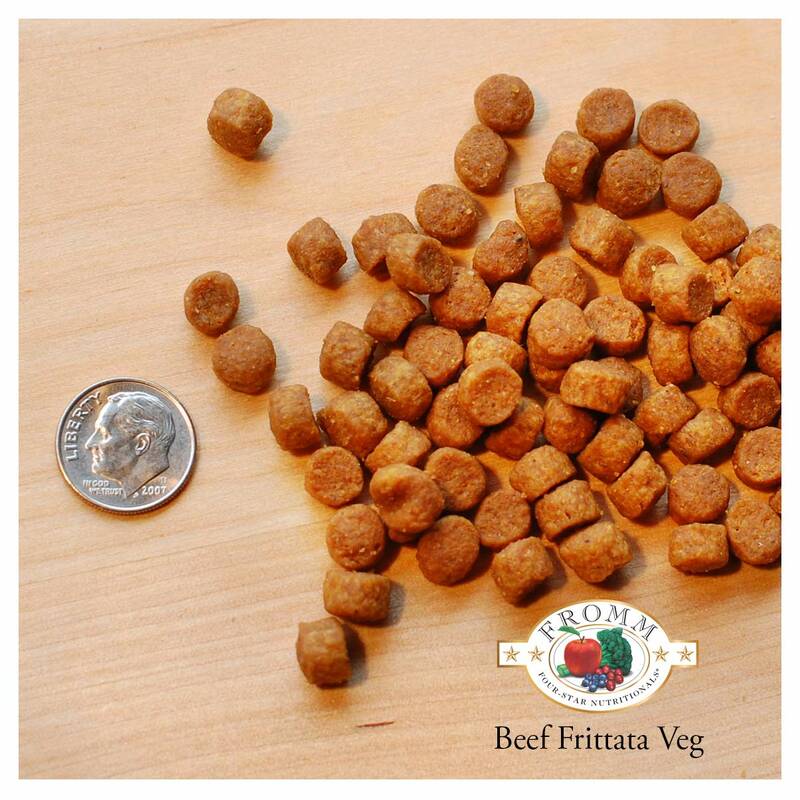 Beef Frittata Veg® Recipe provides complete and balanced nutrition for dogs of all ages and can be alternated with other Fromm Four-Star recipes. 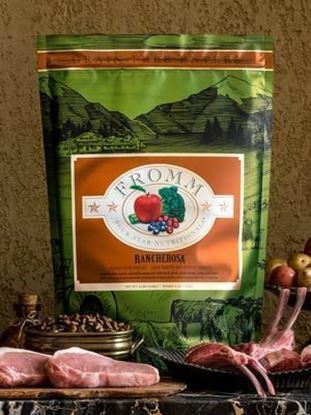 INGREDIENTS: Beef, beef broth, dried egg product, lentils, peas, pork meat and bone meal, potatoes, pork, pork fat (preserved with mixed tocopherols), sweet potatoes, dried tomato pomace, pork liver, beef liver, chickpeas, pea protein, salmon oil (preserved with mixed tocopherols), pea flour, cheese, flaxseed, carrots, apples, broccoli, celery, natural flavor, Vitamins [choline chloride, potassium chloride, Vitamin E supplement, ascorbic acid, calcium carbonate, riboflavin supplement, niacin supplement, calcium pantothenate, Vitamin A supplement, Vitamin D3 supplement, pyridoxine hydrochloride, biotin, Vitamin B12 supplement, thiamine mononitrate, folic acid], chicory root extract, salt, Minerals [zinc sulfate, manganese sulfate, ferrous sulfate, magnesium sulfate, zinc proteinate, ferrous proteinate, manganese proteinate, copper sulfate, magnesium proteinate, copper proteinate, calcium iodate], cranberries, yucca schidigera extract, sorbic acid (preservative), blueberries, sodium selenite, taurine, dried Pediococcus acidilactici fermentation product, dried Lactobacillus acidophilus fermentation product, dried Lactobacillus plantarum fermentation product, dried Bifidobacterium longum fermentation product. 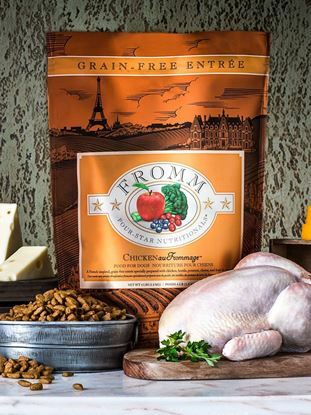 Fromm Four-Star Nutritionals® Beef Frittata Veg® Recipe Food for Dogs is formulated to meet the nutritional levels established by the AAFCO Dog Food Nutrient Profiles for all life stages, including growth of large size dogs (70 lb. or more as an adult).